Be a member of the group. 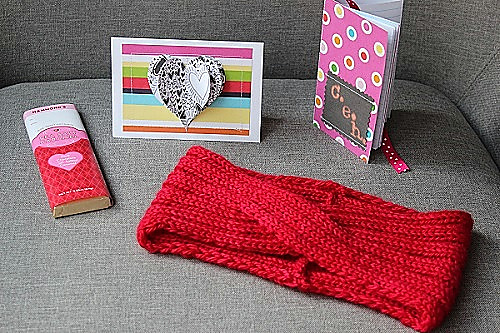 Send a small knit, crocheted, or sewn gift, a card and a small treat ($5.00 max) to your secret swap partner. Participate in the swap discussion at least once a week. When you receive your package, you must post your thanks as soon as possible and post a photo as quickly as you can. Well, I must say, this swap exceeded my expectations. The participants were absolute rock stars! Lovely packages were sent and received, and the hand crafted items were just amazing – creative and beautifully made. Just take a look! 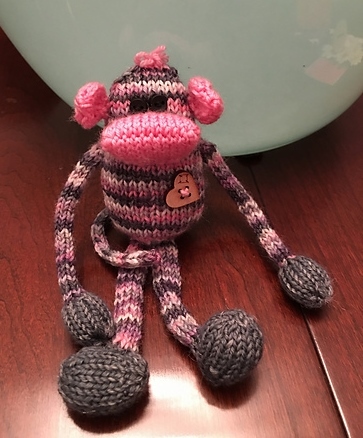 I love the adorable sock monkey Carla made! It’s just too cute and sweet, made in Gnome Acres yarn with a Gnome Acres button. Pattern is Jerry the Musical Monkey by Rebecca Danger. 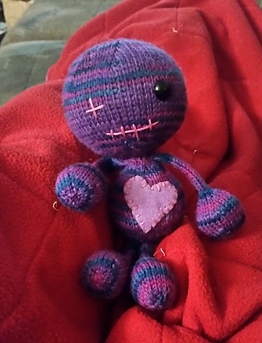 Torunn, whose knitting talents never cease to amaze me, sent this little guy, a voodoo doll named Valentine, all the way from Norway to her swap partner (SP). Pattern is Voodoo You Love Me by Susan Claudino, and he’s knit in Knit Picks Stroll. The cutest little voodoo doll ever!!! 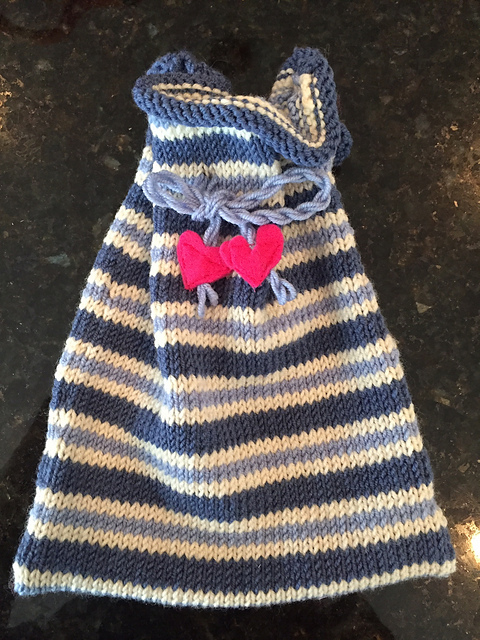 Melanie made this lovely bag, a Valentine Pouch by Lion Brand Yarn, worked in Lion Brand LB Collection Superwash Merino, for her swap partner. Such beautiful knitting! 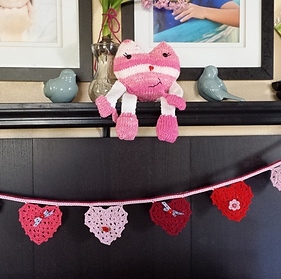 This heart made by Janie now makes its home in its new valentine-y environment. So sweet and quintessentially February 14! I was the fortunate recipient of this swap gift from my friend Stefanie. The card and notebook are wonderfully hand stitched. Love the initials stamped with bleach on the notebook! I love this warm and red turban she made for me…stylin’! Pattern is Turban(d) by Amelie Bernier, knit in Lorna’s Laces Shepherd Worsted Solid in Bold Red. Also included was delicious chocolate! Half the fun of the swaps, of course, is preparing the gift for your SP. I knit two dishcloths for Torunn, using the pattern From My Heart Washcloth by Tabitha’s Heart. 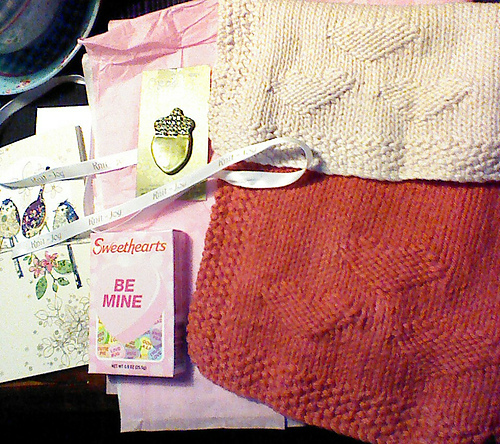 Some conversation hearts, a ceramic button from One of a Kind Buttons, a pretty card and a little Knit=Joy ribbon (thanks, Meg! ), and we’re all set! Made with love! From top down, left to right: Dragon by Heather, Ear Bud Pouches by Alex, Egg to Owl by Diana, Pillowcases by Debby, Coffee Mug Rug by Becky, Cupig and Mug Hug by Susan, Sock Monkey by Carla, Tape Measure by Amber, Dishcloths by Debbie, Voodoo Doll by Torunn, Dishcloths by me, Turban by Stefanie, Cupig by Jen, Heart Garland by Missy, Heart by Janie, Valentine Pouch by Melanie. Alex (alex and knits) and Stefanie (Wooly Cakes and Wooden Spoons) both wrote wonderful blog posts about their experiences with the Wuv Tru Wuv swap. 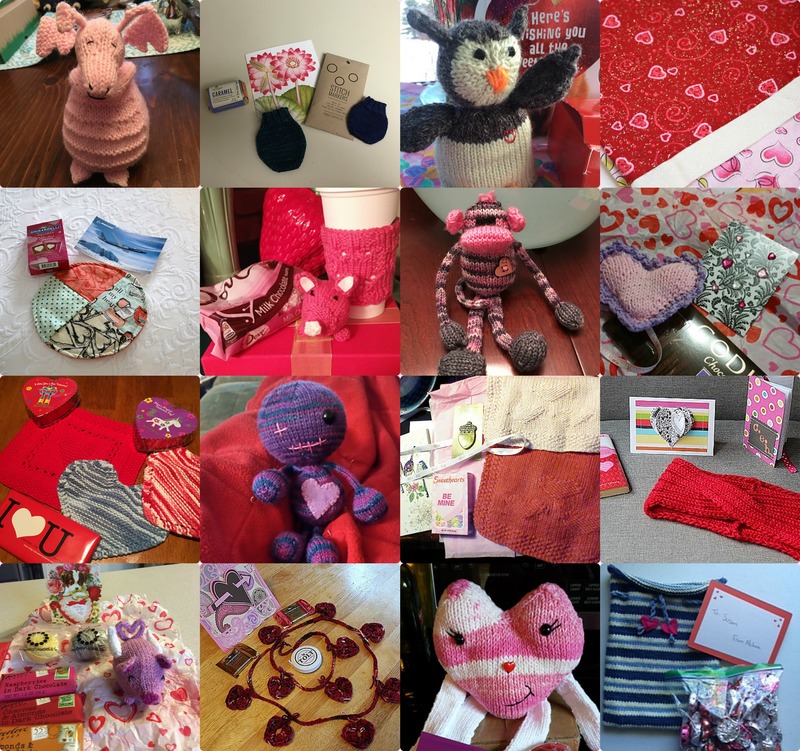 They are both excellent writers as well as knitters; their posts may be found here: Alex’s V-Day Swap Update and Stefanie’s Wuv, Tru Wuv: A Valentine’s Day Mini Swap. Thanks to both of them for sharing their knitting and writing talents! 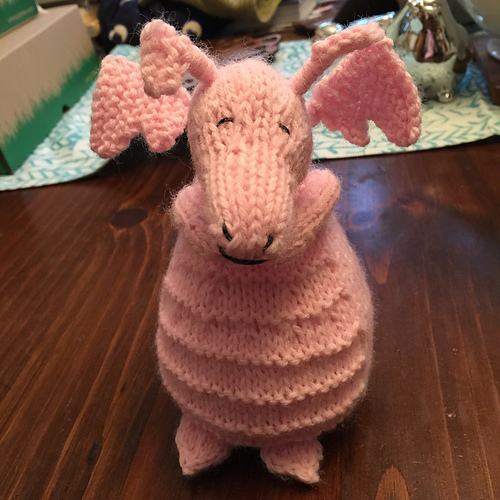 And I leave you with this adorable mini dragon made by Heather. Just perfect in pink! And if you read Alex’s blog post linked above, you’ll read the sweetest story about Alex’s daughter’s reaction and this dragon’s new name, Pony Dragon. Adorbs! Pattern, Little Dragon by Susan B. Anderson. Our group has the best swaps! I can’t wait until the next one.